may be analyzed readily, but for purposes of the present discussion, it will be assumed that the accelerator to be used is of the lever type. The first point of interest in designing the accelerator is the time which should be allowed for the completion of the transfer of kinetic energy. From the standpoint of attaining a high rate of fire, it would be desirable to accomplish the transfer rapidly for two reasons. First, this would quickly bring the bolt to a high velocity, thus dccrcasing the time required for the completion of the bolt movement. Second, the barrel velocity would be reduced quickly with the result that the rearward travel of the barrel would be relatively small. This would be advantageous because it would reduce the distance the bolt must move to produce an opening large enough to permit feeding. On the other hand, quick transfer of kinetic energy requires a high acceleration of the bolt and rapid deceleration of the barrel and the resulting inertia reactions will cause large forces to act on the accelerator mechanism. Increasing the time allowed for the transfer of energy will rcducc the acceleration and the forces on the mechanism but will also result in decreasing the rate of fire. Considering the above factors, the time allowed for energy transfer should be some moderate value; not so short that excessive forces will be produced and not so long that the rate of fire will be reduced seriously- For the gun of the example a value of 0.004 second should be acceptable. After the selection of the length of time which will be allowed for the action of the accelerating device, the next step is to dccidc what motion characteristics are desired for this interval. In order for the energy transfer to occur with minimum shock, it would be reasonable to arrange the mechanism so that the forces on the parts will at first be zero and then will increase smoothly to the higher values required to produce rapid acceleration and deceleration. Such a force variation will result in a condition in which the displacements and velocities, as well as the accelerations, will vary in a smooth manner. Exccpt for the relatively small amount of kinetic energy expended in compressing the bolt driving spring and barrel return spring during the period of acceleration, and except for the small gain in energy due to the remaining blowback action and the slight incidental losses in the operation of the mechanism, the sum of the kinetic energies contained in the recoiling system consisting of the barrel and bolt will remain constant. Therefore, the characteristics of the bolt and barrel movements will depend mainly on the properties of the accelerating mechanism. Sincc the accclcrating mechanism can be designed to establish the relationships between the movements of the recoiling parts, these movements can be controlled as desired. In other words it is possible to approach the design of the accelerator by first specifying the desired variation in barrel velocity. 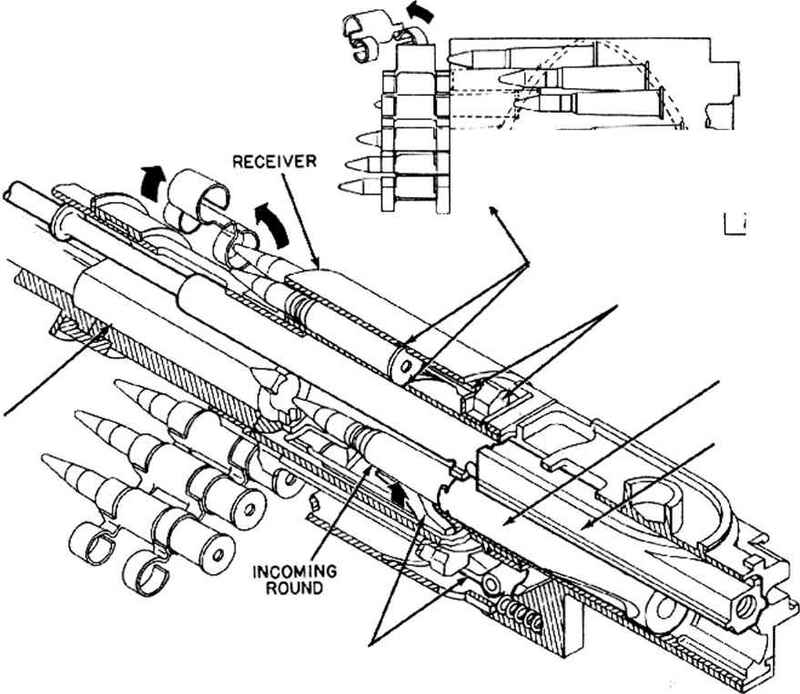 The corresponding velocity variations for the bolt can then be determined by taking into consideration the kinetic energy obtained from the barrel, the energy imparted by the remaining blowback action, and the energy lost in operating the gun mechanism. The variations of bolt velocity and barrel velocity being known, the accelerating device can be designed so that these velocity variations will be produced. The basic procedure by which the accelerator may be designed is as follows: First, the desired characteristics of the barrel velocity arc established by drawing, arbitrarily, a suitable barrel velocity curve for the interval of acceleration. The shape of the curve should be similar to that shown in fig. 2-25 so that the deceleration 'and consequently, the force required to produce the deceleration) will start at zero and increase smoothly to the maximum value at the end of the interval. Note that the barrel velocity curve selected for the example indicates a residual velocity of 6 feet per second at the end of the acceleration interval.